Tesla wants to build a huge factory in China and begin investing more heavily in the Model Y. But with what money? Save the date: Aug. 1 will bring another ugly bottom line quarter from Tesla (TSLA - Get Report) . And by extension, another quarter of an insane amount of cash burn and questions from Wall Street and Twitter trolls on a Tesla capital raise. Shares briefly rallied to $303 on Wednesday, but as of midday trading, are down about 50 basis points to $296.50. So how do the analysts and industry professionals feel about Tesla? Gordon Johnson, managing director at Vertical Group, tells TheStreet he and his team believe Tesla will exit the quarter with less than $1 billion in cash. Frightening. Johnson argues that the cash actually available to the company is much less than it appears to investors. 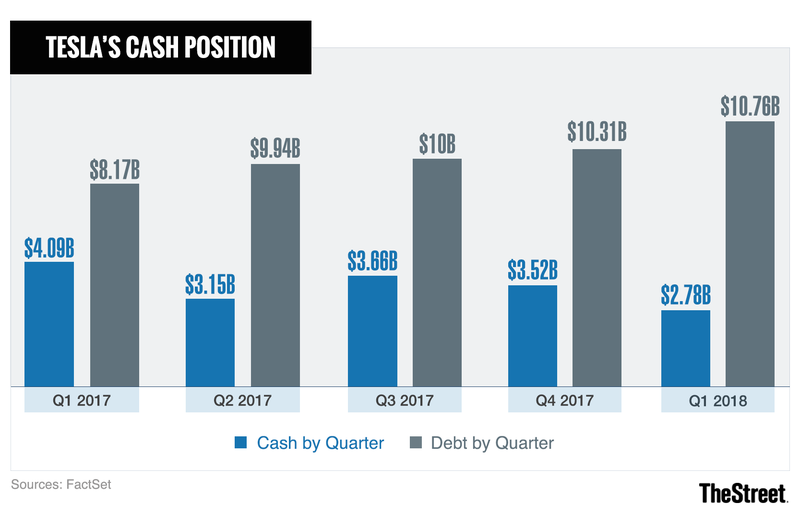 If suppliers don't help Tesla out and the automaker is unable to raise the necessary funds, the company could be heading for a "cash event" Johnson contends. News from The Wall Street Journal recently made it seem like Tesla was begging some of its suppliers for refunds on previously made payments. That didn't appear to be the case after Tesla released a clarification on the situation to TheStreet. That said, the automaker's actions -- and weak financial standing -- do suggest that it's a bit tight for cash. It's either raise the needed cash or throttle back growth says Doug Mehl, a partner at consulting firm A.T. Kearney. Here's a peak into the numbers at Tesla. The cheapest Model 3 consumers can drive out of the showroom today will run $49,000, excluding sales tax. If Tesla can produce 5,000 Model 3s a week that sell for $50,000, it will ring up $6.5 billion in sales over the next six months. That revenue could be meaningless though, depending on how much of it falls to the bottom line. A recent analysis by automotive consultancy firm Munro & Associates pegs the Model 3 potentially garnering profit margins of 30%. Presumably, its premium models would garner even higher margins. Using some very generous assumptions, let's say the Model 3 will generate an eye-popping 46% profit margin in the second half of 2018. That will net Tesla just $3 billion pre-tax. Saying "just $3 billion" pre-tax sounds insane, because that's a lot of money for a cash-bleeding entity like Tesla. But it will unlikely go far enough to the feed the beast of an electric car maker in ramp up mode and the desire by Elon Musk to move quicker into new models/geographies. "We see Tesla potentially requiring over $10 billion in external capital raises and debt re-financing by 2020, given the company's current operations and plans for China and the Model Y," says Goldman Sachs analyst David Tamberinno. "This capital raise could come in various forms and combinations, including convertible debt, bonds, and an equity raise." "While our estimates remain below company target levels for Model 3 production, we model cash needs under a scenario where the company sustainably produces 10k/week Model 3 vehicles in 2020 -- and moves forward with the Model Y and plant capacity in China. Under this scenario, Tesla capital needs would be half of our estimate," Tamberrino said. In other words, even under rosy assumptions, Tesla would still likely need to raise at least $5 billion by 2020. "I Specifically Don't Want To"
Those words were spoken by Musk on the company's first-quarter conference call when asked about raising capital this year. The first Gigafactory in Nevada was originally priced at about $5 billion to build, but overran on costs. Tesla's China factory, Gigafactory 3, could easily surpass that amount though given that it will house auto production as well -- something that won't begin until two years after construction starts, according to the company. In other words, its China ambitions will burn more cash for Tesla for several years rather than build it until the first car rolls off the production line. It's hard to determine a cost for the project at this point, according to John Engle, president of Almington Capital, a venture capital and private equity firm outside of Chicago. General Motors (GM - Get Report) invested in five new Chinese factories a few years ago and that came out to $5.6 billion, he noted. "We would call that the minimum base cost for a factory planning to churn out 500,000 vehicles per year. In actuality, the cost will likely be higher, since Gigafactory 3 is supposed to build both cars and batteries," Engle said. "A $6 billion price-tag is well within possibility." Further, Musk said the Model Y will begin to receive noticeable capex in 2019, but like the factory, won't contribute positively to free-cash flow as production won't begin until 2020. Also worth mentioning is the company's expanding Supercharger network, where construction now seems to be taking on some delays. There's also the sporty Roadster and hulking Tesla semi truck sitting in the pipeline as well. Again, the need for cash is no secret. But it is a major concern. Needham analyst Rajvindra Gill recently downgraded Tesla's stock to underperform amid these cash concerns. With expiring federal tax credits for buyers, too high production costs, a projected $6 billion free-cash flow burn through 2020 and too slow a gross margin improvement, he says Tesla is overvalued at current levels. Gill isn't alone on the Street. "We continue to be concerned that [Tesla's] free cash flow has the potential to be a larger outflow, given the fact that the much heralded production rate improvement...means that many more vehicles were produced in 2Q (53,339) than were delivered (40,740), suggesting a large investment in working capital relative to finished goods inventory," Morgan Stanley analyst Adam Jonas said ahead of Tesla's earnings report. Added Jonas, "Additionally, we worry about margin, given the potential for overtime, premium freight, and other expenses employed to ramp production in a seemingly inefficient manner (e.g., constructing an additional "tent" assembly line in a temporary facility adjacent to its main assembly plant)." Not every Tesla number cruncher is completely negative, though. Ben Kallo, senior research analyst at R.W. Baird, said that "Tesla has a differentiated ability to attract new capital, particularly as the company builds out its business. We continue to believe Tesla has access to capital markets, particularly as the company achieves production milestones and continues to build out its business." Romit Shah, managing director and senior analyst at Nomura was also more upbeat. He said, "If Tesla can execute to plan, we believe that the narrative around bankruptcy risk will go away, thereby reducing short interest and driving the stock higher." Notably, there's a huge difference in transforming to a profitable outfit and then raising capital for growth needs, rather than failing to become profitable and raising capital to stay alive. Many on Wall Street realize that, while those that don't are poised to get burned. The best course of action for Tesla then? Musk should just hit up an investment bank for another high yield debt offering. And oh yeah, stay off Twitter.